"In Harm's Way", by Doug Stanton, is the riveting tale of the sinking of the USS Indianapolis. The true story of a tragic event that took place during World War II, you'll find In Harm's Way reads more like a novel than nonfiction. Photographs, notes, an index and bibliography, plus a final crew list, add depth and substance. A must read for anyone who is interested in not just war, but tales of survival. This is one book that is hard to put down once you begin! The initial launch of the USS Indianapolis was on November 7, 1931, and it was then commissioned for service in 1932. Although the Indianapolis underwent training exercises in the Pacific and Panama Canal zones for a time, her main duty during the 1930s was carrying President Franklin D. Roosevelt on state visits. During World War II, the USS Indianapolis joined with other naval carriers, carrying out strikes against the Japanese. In 1945, the USS Indianapolis joined in attacks on Iwo Jima and the home islands of Japan. During the Ryukyu Island operation, which occurred on March 31, 1945, the USS Indianapolis was bombed by a Kamikaze plane. Although two large holes were blown through the ship's keel, the Indianapolis was able to return for repairs under her own power. In Harm's Way begins with the USS Indianapolis undergoing repairs, after being bombed by the kamikazi pilot. Before repairs are completed, Charles McVay, Captain of the USS Indianapolis, receives orders to carry a mysterious package to the island of Tinian. Captain McVay complies with his orders, delivers the package, and then heads to Guam. 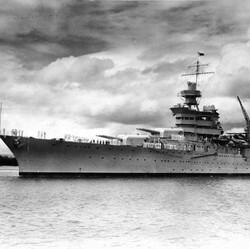 From there, the Indianapolis is ordered to set sail for Leyte in the Philippines. It is in Guam that the problems begin with the journey across the ocean. A lack of information and communication between the Naval authorities and Captain McVay set the stage for the horrific disaster. As the story continues, each person is described in such detail that you get to actually know the person and their emotions. A minute by minute account is given of the sailing, the torpedo launch, and the resulting sinking of the ship. Although the outcome of the story is known, you will still find yourself holding your breath, hoping the inevitable will not happen. After the excruciating account of the sinking, the story continues with the battle for survival in the Philippine Sea. Dehydration, sharks and injuries contribute to the loss of life for many of the crew. Some will simply give up, and drown, while others find an inner strength to carry on. The horror of the waters and the hopelessness of rescue are more than just words on a page. The remaining chapters of In Harms Way outline what happens to the survivors of the USS Indianapolis. An unbelievable conclusion, not only for the survivors, but for Captain McVay and the Navy. After four grueling days in the sea, a bomber pilot spots the men in the water while out on submarine patrol. He radios his find, and a seaplane is dispatched. Several men, including the seaplane pilot, and captain of the Cecil Doyle, put the lives and careers of themselves and their crew at risk in order to save the Indianapolis survivors. After the rescue, it takes two weeks for the Navy to announce the sinking and loss of the USS Indianapolis. Their reasoning was they did not want the disaster to overshadow the news of the Japanese surrender. But was this really the reason for the delay? Several months after the sinking, Capt. McVay is subject to inquiry, and charged with two counts. One charge was eventually dropped, yet he was convicted on the other. Because information regarding the circumstances leading up to the sinking were classified, they were unable to be used in his defense. Capt. McVay therefore received a court martial, damaging his Navy career forever. Although the Captain is responsible for his ship and crew, sometimes there are circumstances beyond his control. Such was the case with the sinking of the USS Indianapolis. Do you agree with the initial findings of the Navy and the court martial? Or, do you believe he was unjustly convicted? Should Captain McVay be held accountable? In 1990, survivors of the USS Indianapolis, under the name "The USS Indianapolis (CA-35) Survivors Memorial Organization, Inc.", designed, paid for, and erected a monument commemorating the USS Indianapolis and it's crew. It was paid for entirely by private funds, with no money donated by the government. In 1995, an act of Congress designated it a National Memorial, after which a dedication ceremony was conducted on August 2nd. The Monument is located at Walnut St. & Senate Ave. in Indianapolis, Indiana. The memorial contains the names of the crew members, and one passenger, who made up the final crew list. It is open 24 hours a day for viewing and reflecting. On July 13, 2001, the Department of the Navy announced their decision to exonerate Captain McVay. They did not, however, erase the conviction from his record. Unfortunately, Capt. McVay passed away by his own hand in 1968, never to learn he was cleared. While you may have learned of the sinking of the USS Indianapolis in history class, there are many more details in this book than can be learned in a classroom. It is a story of courage and survival, and one of accountability. It is a tragic story, and hopefully one that will never be repeated. Take the time to read this book, then pass it along to a friend. Then take time to visit the memorial, and honor those brave heroes. CountrySunshine, I remember reading about the terrible experiences of the crew, particularly in regard to sharks. Let's hope that Captain McVay died knowing that because of the support of those who loved and respected him, time would exonerate him. This was indeed a terrible loss.